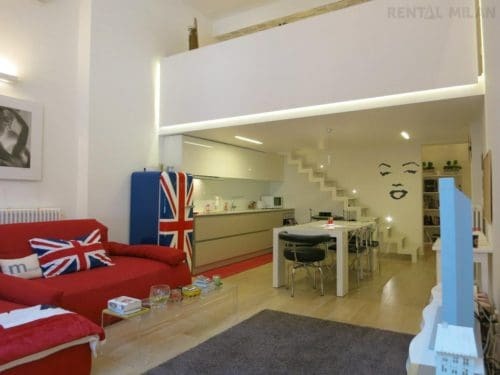 Stunning 2 bedrooms loft apartment Milan with a modern design, totally renovated, with all the comforts. Very quiet and bright, facing the inner courtyard. On the ground floor there is the entrance hall, a walk-in closet, the living room, a fully equipped modern kitchen, a large beautiful bathroom with shower. On the loft floor there are the 2 bedrooms: one bedroom has a double bed and the other bedroom has a sofa double bed and a desk. Air conditioning, Wifi, microwaves, washing machine/dryer and dish washer . Perfectly located, in a safe residential area close to the center and Porta Ticinese, between Bocconi University and Navigli area. Close to the main public transports, nearby you can find every kind of shops and service. Restaurants, bars, art galleries, gym. Safe residential area, walking distance from the city center.